Formerly on the books at Colchester United as an amateur, Riding signed a part time professional contract for Exeter City in July 1964. He combined playing for the club with his job at the County Hall in Exeter. 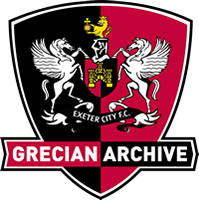 But, although a noted goalscorer for the reserves, he was to only feature in one league match for the Grecians, against Scunthorpe United, a 2-1 defeat at The Old Showground in February 1966. Having asked for transfer in April 1966, he was released at the end of the season, Riding linked up with Yeovil Town, signing at the same time as his Grecians’ team mate, Graham Rees. He netted thirteen goals for them in 30 first team outings in 1966-67, but left the club at the end of the season. Riding then signed for Minehead before joining Bridport in September 1967 and scored 58 goals for them in three seasons. A knee ligament injury forced his retirement from the game in October 1970. Living in Ringwood in 1970, Riding worked for the New Forest District Council in Lyndhurst as an accountant.